To get the desired performance from an ACE Frame Mounted Pump, the proper speed ratio between the pump and drive source must be established. The following link should be helpful: Pulley Ratio. Proper belt alignment and belt tension will prevent premature bearing failure in the clutch and/or the pump. The following link should be helpful: Belt Adjustment. The direction of rotation is always determined WHEN FACING THE SHAFT. This rule applies for the pump shaft and the drive shaft. 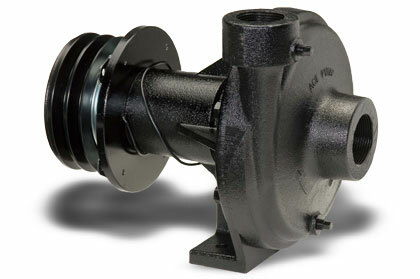 Ace Frame Mounted pumps are available in both clockwise (CW) and counterclockwise (CCW) rotation. Ace model numbers which include a “CW” have a clockwise rotation; all other models are counterclockwise rotation. 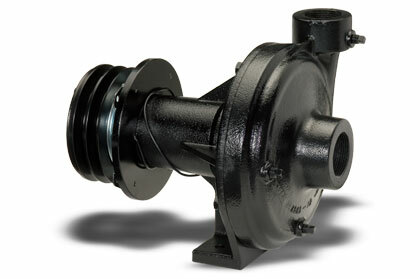 The following link should be helpful: Pump Rotation. 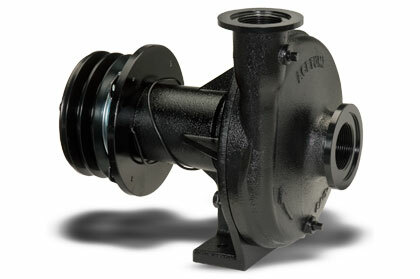 Ace offers the widest assortment of frame mounted centrifugal pumps for spray applications. These rugged, compact models offer mounting flexibility. FMK-30-2M Pulley has a pitch diameter of 6” (15.2 cm) and a 1-3/8” (34.9 cm) bore with 21 splines for mounting on a 1000 RPM tractor PTO. The pulley has a two groove design for use with two Poly Flex belts. 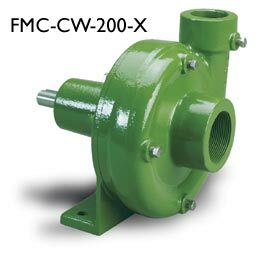 FMK-30-4M Same as above with four groove design for driving two pumps. FMK-30-2M-175 Pulley has a pitch diameter of 6” (15.2 cm) and a 1-3/4” (44.5 cm) bore with 20 splines for mounting on a 1000 RPM tractor PTO. This pulley has a two groove design for use with two Poly Flex belts. FMK-30-4M-175 Same as above with four groove design for driving two pumps.